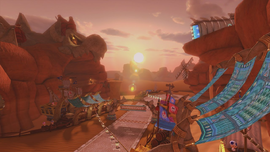 Bone-Dry Dunes (written as Bone Dry Dunes in British English) is the second race track in the Special Cup of Mario Kart 8 and Mario Kart 8 Deluxe. This course takes place on a desert and canyon place with shifting sand rivers and bones. Several ships ridden by Shy Guys and Toads sail through quicksand during the race, occasionally throwing out coins onto the track, similar to the train in N64 Rainbow Road. The course starts in an area with a small audience and tents. The road turns right before a sinuous section, and briefly splits into two paths (a ramp is placed between them). After a winding path, racers will find a wooden bridge which leads to a canyon filled with giant bones. The road now is sandy, and begins with a right turn. The characters encounter a Bone Piranha Plant (which behaves just like a regular Piranha Plant, biting whoever is near). The following area has two distinct road options: the one to the left keeps the sand ground, and features several more Bone Piranha Plants; the one to the right is an anti-gravity section where characters race along a wall made up of ribs, featuring some spin boosters. Both end with a glider segment, which takes racers across the start-finish line and into a cave, with the mouth being a giant skull and hands resembling Dry Bowser. Entering the cave, there are a higher and a lower path to choose. The higher path is a narrow and rather short wooden catwalk. Sometimes the glider will not allow racers to go here. Item Boxes can be found on this path. The lower one is the soil of the cave. Inside it, some Dry Bones wander around on the road. A left turn marks the exit of the cave right before the finish line. Players can use a Mushroom to use the ramp between the two paths near the start of the track. To the left of the last curve, there is an opening between a line of bones which players can cut across via Mushroom. The staff ghost for this track is Morton on the Tri-Speeder, with a time of 2:13.391. In Mario Kart 8 Deluxe 200cc, the staff ghost is Dry Bones with a time of 1:39.330. The pots have enemies, scenery, and coins from Super Mario Bros.. In one piece of fabric found in tents near the finish line, the Angry Sun enemy from Super Mario Bros. 3 appears. The Staff Ghost for this course is Morton, a reference to his role as the boss of the desert world in previous games. The Dutch name of the course, Dry Bowsers Woestijn, is the only name for the course that involves Dry Bowser. This page was last edited on December 21, 2018, at 17:42.